The Joint Commission/NFPA® Life Safety Book for Health Care Organizations is your guide to understand how NFPA 101® relates to Joint Commission standards for accreditation. Each facility classified as a 'Healthcare Occupancy' is required to comply with the Joint Commission's Life Safety (LS) standards and Elements of Performance, as well as with NFPA 101, Life Safety Code® (LSC). 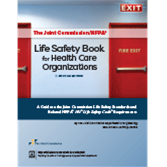 The second edition of The Joint Commission/NFPA Life Safety Book for Health Care Organizations captures the information you need for getting your organization accredited in a single, easy-to-reference volume. Written by leading experts in the field, this comprehensive guide to health care facility fire safety specifies exactly how The Joint Commission LS chapter and the 2012 edition of the NFPA Life Safety Code relate, through valuable commentary, tables, and color graphics. Understand how NFPA 101® relates to Joint Commission standards with The Joint Commission/NFPA Life Safety Book for Health Care Organizations. Fire safety is so important in a health care setting that The Joint Commission has devoted an entire standards chapter to it: the "Life Safety" chapter, which is structured to directly reflect NFPA 101®, Life Safety Code®. Learn exactly how The Joint Commission "Life Safety" chapter and NFPA 101, Life Safety Code (LSC) relate through this comprehensive source written by two of the leading fire safety experts in the field.